Values rooted in best practices and community. With roots in New Mexico’s architectural heritage, Jay Rembe merges past and present with innovative developments that improve neighborhood value, enhance the urban experience and demonstrate Jay’s commitment to urban design ideals. Working through partnerships and his Albuquerque firm Rembe Urban Design + Development, Jay creates commercial, residential and mixed-use infill projects that resonate with the landscape and history of their place. “Working collaboratively with neighborhood groups is key to our approach. 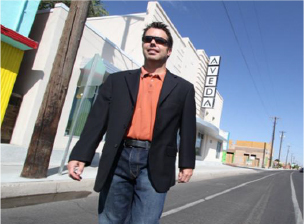 Having lived most of my life in Albuquerque, it’s important that my projects add value to their environment, both architecturally and aesthetically, and that the experience of being in the building or on its grounds is satisfying and memorable,” Jay explains. Urban development in west downtown Albuquerque. Jay’s infill projects west of downtown include Country Club Plaza, a three-acre mixed-use project with 75,000 square feet of existing and proposed buildings and the historic Horn Oil building, recently renovated for retail and office use; and Country Club Place, a 31,000-square foot mixed use project that includes the former 1940s Sandia Theater building, recently renovated for an Aveda Institute, and a new Albuquerque location for the Santa Fe restaurant Vinaigrette. Heather joined rembe urban design + development in 2017. She graduated from the Albuquerque Academy and received her Bachelor’s degree in Business Administration with a major in finance from the University of Arizona, Tucson, Arizona. As a Senior Partner with Rocky Mountain Group, LLC, Heather worked as a consultant for rural hospitals, county and tribal governments and non-profit organizations. Her primary area of focus included grant writing, budget development, strategic planning, community-needs assessments, and program evaluation. Most recently as a business owner and office administrator, Heather has a comprehensive experience in project management, systems development and implementation, financial planning, fiscal management, marketing and client service. Heather’s extensive experience in finance is central to the firm’s successful fiscal management, precise budgeting and planning, and rigorous project oversight. Heather expertly manages all aspects of banking requirements for credit lines, draws for construction projects, and all the demanding day-to-day operations of a multi-faceted development firm. In executing her responsibilities at rembe urban design + development, Heather provides optimal project control and management, expert property management and skilled client communications.